Mostly heart-shaped food items are popular this year for Valentine's Day but this year's deals and specials also include a few dinner-for-twos and even a promotion for singles. - Auntie Anne's - One February 14, 2019, they'll be selling heart-shaped pretzels in Original and Cinnamon Sugar varieties. If you're signed on to their email list, they'll be sending out a buy one, get one free offer for the heart-shaped pretzels good on February 14th. - Baskin-Robbins - They have a shareable $5 Valentine's sundae. - Bojangles' - They're baking Heart-Shaped Bo-Berry Biscuits through Thursday, February 14, 2019 at participating locations. - Bruegger's - Heart-shaped bagels are available at participating locations for pre-order through February 13, 2019 (pick-up on February 14). The come in three varieties: Cinnamon Raisin, Plain, and Blueberry. - Chick-fil-A - You can get a 30-count order of chicken nuggets, 10 Chick-n-Minis, or 6-count Chocolate Chunk Cookies in a heart-shaped container at participating locations through February 28, 2019. - Coolhaus (Culver City, CA location only) - Free shipping and branded scooper for Coolhaus Postmates orders placed on February 14, 2019. - Dunkin' Donuts - This year's Valentine's Day line up includes new Cookie Dough & Brownie Double Filled Donuts. 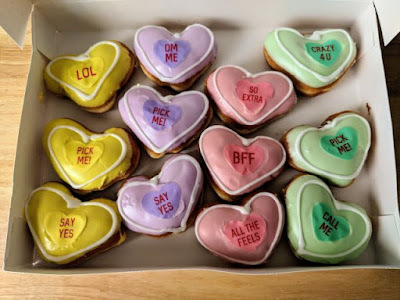 - Einstein Bros. Bagels - They're offering heart-shaped bagels that you can be order in any flavor by the half dozen or dozen through February 13, 2019. They'll also have plain and chocolate chip heart-shaped bagels at participating locations on Valentine's Day. - El Pollo Loco - They're offering a "Dinner & Dessert for Two" special that includes a Half Chicken (4 pieces), 2 Small Sides, Flour/corn Tortillas or Chips, 2 Churros and choice of one: Classic Nachos, Large Chicken Tortilla Soup, or Large Loco Salad. Prices vary. - Jack in the Box - Valentine’s Day Promo: Free 5-piece Mini Churros, NY Style Cheesecake or Regular Shake with any purchase via the mobile app on February 14th, 2019. - Jet's Pizza - On February 14, 2019, all Jet's Pizza locations nationwide will be selling 6-slice heart-shaped pizzas, while supplies last. Heart-shaped Jet's Bread and Cinnamon Stix will be available as well. - Krispy Kreme - Valentine's Conversation Heart Donuts are the order of the day at Krispy Kreme. - McAlister's - Family Date Night - Up to two free kids meal per adult entree purchase on February 14, 2019 (dine-in or carryout only). - Papa John's - The heart-shaped pizza is available through February 14, 2019. - Papa Murphy's - They're again offering take-and-bake heart-shaped pizzas. - Penn Station - "2 Can Dine for $14.99" - Two 6-inch sandwiches, two small fresh-cut French fries, and two regular drinks for $14.99 on February 14, 2019. - Potbelly Sandwich Shop - Celebrating single folk, they're giving a free cookie to anyone who goes to a Potbelly location without a significant other on February 14, 2019. - Pretzelmaker - Through February 28, 2019 at participating locations, Pretzels and Pretzel Bites are available in Pink Cinnamon Sugar, which is their regular cinnamon sugar but pink. Customers who wear pink (a shirt, pants, shorts, skirt or hat that is predominantly pink) to stores on Wednesday, February 13, 2019 will receive a free* Buy-One-Get-One Pink Cinnamon Sugar Pretzel when they say "On Wednesday, we wear pink." Participating locations only in the U.S.
- Qdoba - Qdoba for a Kiss - Get a free entree when you purchase an entree (of greater or equal value) and share a kiss with anyone or anything on Feb. 14, 2019. - Starbucks - The Cherry Mocha is back through February 14, 2019. They also have some Valentine's Day-themed treats in the bakery display. - Tim Hortons - They offer two new donuts, the Vanilla Be Mine Donut and Chocolate Be Mine Donut, for Valentine's Day. The Vanilla Be Mine Donut is a raspberry-jam filled donut dipped in vanilla fondant topped with red shimmer, while the Chocolate Be Mine Donut is a Venetian cream-filled donut dipped in chocolate fondant topped with red shimmer. They also have a number of baked goods and drinks for the occasion, including: Red Velvet French Vanilla, Latte, and Hot Chocolate; Red Velvet cookies; Red Velvet muffins; and White Chocolate Cranberry scones. - White Castle - In addition to taking reservations for a Valentine's Day at select locations, they're also offering $20 Valentine's Day Crave Cases for delivery on February 14, 2019 only (the cases include 10 Cheese Sliders, 20 Chicken Rings, two small drinks, two desserts on a stick and "lots of fun extras" but there are only 10 available per location).